On June 8-10, the President of the Republic of Uzbekistan Shavkat Mirziyoyev attended the 18th meeting of the Council of Heads of States of the Shanghai Cooperation Organization, in the city of Qingdao. Within the framework of the summit on June 9, the leaders of the SCO member states held a number of bilateral and multilateral meetings, discussed current issues of regional and international agenda. The main events of the summit were held on June 10. First, the heads of states held a meeting in a narrow format. The meeting, chaired by the President of the People’s Republic of China Xi Jinping, was attended by the President of the Republic of Uzbekistan Shavkat Mirziyoyev, the Prime Minister of the Republic of India Narendra Modi, the President of the Republic of Kazakhstan Nursultan Nazarbayev, the President of the Kyrgyz Republic Sooronbay Jeenbekov, the President of the Islamic Republic of Pakistan Mamnoon Hussain, the President of the Russian Federation Vladimir Putin, the President of the Republic of Tajikistan Emomali Rahmon. Such current issues as comprehensive development of relations, expansion of economic and investment partnership between the SCO member states, intensification of cooperation in the spheres of innovations, high technologies and transport communications, and environmental protection were discussed at the meeting. Heads of states noted fruitful and successful activities of China during the chairmanship in the SCO, emphasized that over the past year more than 100 events were held with participation of heads of various ministries and departments of the member states, important results were achieved in their course. The Council’s meeting at the expanded format, along with member states, was attended by the heads of delegations of countries with the status of observers and dialogue partner, as well as international organizations. The sides exchanged views on prospective areas of the SCO development, important regional and international problems. Issues of expansion of economic and investment partnership, intensification of cooperation in transport and communication sphere and other aspects of multilateral cooperation were discussed. The President of the Republic of Uzbekistan Shavkat Mirziyoyev addressed the summit. The Heads of states approved the Director of the Institute for Strategic and Interregional Studies under the President of the Republic of Uzbekistan Vladimir Norov to the post of the SCO Secretary-General, representative of Tajikistan Jumakhon Giyosov – to the post of Director of the Executive Committee of the SCO Regional Anti-Terrorist Structure. Following the Summit, the Qingdao Declaration was adopted. 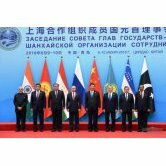 The Heads of states also approved the Program of cooperation of the SCO member states in countering terrorism, separatism and extremism for 2019-2021 and the Action Plan for 2018-2022 on implementation of provisions of the Treaty on long-term good-neighborliness, friendship and cooperation of the SCO member states, signed 17 documents. The chairmanship in the Shanghai Cooperation Organization was transferred to the Kyrgyz Republic. At a meeting with mass media representatives, it was noted that the Qingdao SCO summit was fruitful, the signed documents will contribute to further development of the organization, rapprochement of countries and people of the region. In general, the Qingdao summit opened up new opportunities for the SCO. Within the framework of the SCO summit, the President of the Republic of Uzbekistan Shavkat Mirziyoyev held meetings with the heads of several states. At the meeting with the President of the Russian Federation Vladimir Putin it was noted that relations of strategic partnership and alliance with Russia are a constant course of Uzbekistan’s foreign policy. The current rate and scale of bilateral relations is evidenced by the fact that over the past year 70 mutual visits and 21 interregional meetings have been held. In the first quarter of this year, the volume of trade between our countries has increased by more than 40 percent, said Shavkat Mirziyoyev. After your last year’s visit to Russia, our relations have gained new momentum. As a result of creation of a “green corridor” on your initiative, the volume of fruit and vegetable deliveries from Uzbekistan increased by almost 36 percent. Large investment projects are being implemented with participation of leading Russian companies, said Vladimir Putin. The sides exchanged views on international and regional issues of mutual interest. President Shavkat Mirziyoyev met with the President of the People’s Republic of China Xi Jinping. The President of China noted that PRC attaches great importance to full-scale strategic partnership and multi-format cooperation with Uzbekistan. The President of Uzbekistan congratulated the Head of China on successful chairmanship in the Shanghai Cooperation Organization and the Qingdao Summit, organized at a high-level. Relations between Uzbekistan and China are consistently developing in all important areas. In 2017, the trade turnover between the two countries amounted to $5 billion. At the meeting, issues of further expansion of interaction in economy, trade, investment, transport communications, high technologies and other spheres were discussed. President Shavkat Mirziyoyev also met with the Prime Minister of India Narendra Modi. Shavkat Mirziyoyev congratulated people of India on joining the Shanghai Cooperation Organization and participation in the SCO Summit as a full member. Shavkat Mirziyoyev noted that this meeting is a good opportunity to discuss the implementation of agreements reached earlier and outline the prospects of cooperation. Narendra Modi expressed sincere gratitude for the support provided by Uzbekistan in India’s entry into the SCO. He emphasized that this would open up new opportunities for development of cooperation with Uzbekistan both at bilateral and regional levels. At the meeting, issues of further expansion of Uzbekistan – India cooperation in trade, economic, financial, investment, innovation and humanitarian spheres were discussed. Possibilities of implementation of prospective projects on information technologies, medicine, pharmaceutics, tourism and other areas were considered. The sides exchanged views on current issues of international politics and regional cooperation. The President of the Republic of Uzbekistan Shavkat Mirziyoyev met with the President of the Islamic Republic of Pakistan Mamnoon Hussain. Shavkat Mirziyoyev congratulated Mamnoon Hussain on Pakistan’s accession to Shanghai Cooperation Organization and noted that this will serve to further strengthening relations between Uzbekistan and Pakistan. At the meeting, issues of development of cooperation in trade, economy, agriculture, textile industry and other spheres were discussed. We are pleased that after the conference, held this year in Tashkent, worldwide active efforts began on settlement of the situation in Afghanistan. Everyone understands that the only way to achieve this is dialogue. This meeting is a good opportunity to exchange views on this issue, discuss important issues for our countries, said the President of Uzbekistan. I would like to especially note the rapid pace of implementation of the agreements reached within my visit to Uzbekistan. I express my deep gratitude on behalf of our people and government for holding a major forum on Afghanistan. Your personal attention to this issue has created conditions for development of political decisions, said the President of Afghanistan. The President of the Republic of Uzbekistan Shavkat Mirziyoyev received the First Deputy Secretary-General of the United Nations Amina Mohammed. The Head of the state noted that over the past two years, cooperation between Uzbekistan and the UN has become active, filled with practical content. The visits of representative delegations of the United Nations to Uzbekistan, a consistent implementation of the plan of practical measures on further development of cooperation with the Office of the United Nations High Commissioner for Human Rights were noted. Amina Mohammed recalled with satisfaction the participation of the President of Uzbekistan in the 72nd session of the UN General Assembly, highly appreciated the concrete efforts of Uzbekistan on expanding and strengthening regional cooperation, assisting in restoration of Afghanistan. It was noted that the international conference held in Tashkent on Afghanistan drew attention of the entire international community to this issue. At the meeting, views were exchanged on implementation of the agreements reached earlier. Important directions for further cooperation were discussed in the course of negotiations with the leaders of various UN delegations.